Place an aluminum pan on the grill, add the butter to melt. Put the brats on the other side of the grill. After the butter has melted, add the onions and cook until soft. Once soft, add the can of beer. Once the brats are nicely browned (not cooked through), add them to the pan. Cook with lid on grill for 30 minutes or until brats are cooked through, checking halfway through cooking. 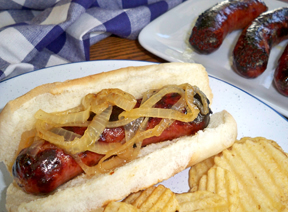 Serve brats with the onions. 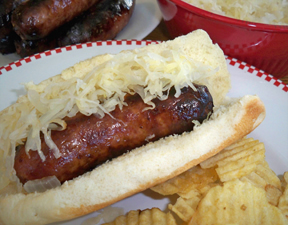 "I love brats and I love beer, so naturally this recipe caught my eye. 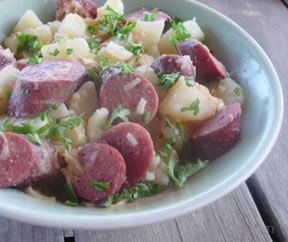 I was searching for a way to grill uncooked brats and found this recipe. It sounded good and fairly simple. So I tried it. 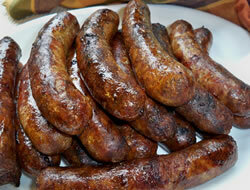 The brats were fantastic! They really had a nice flavor. You have to try them!"